Function: Clears heat, expels wind, invigorates blood, restores consciousness, stops convulsions. Indications: Headache, redness of eyes, sore throat, stiff tongue, febrile diseases, irritability. Function: Clears heat, expels wind, benefits the ear, removes obstructions from the channel. Indications: Headache, redness of the eyes, sudden deafness, sore throat, malaria, pain in arm. Function: Clears heat, expels wind, benefits ears, lifts the mind, removes obstructions from the channel, regulates Qi. Indications: Headache, redness of the eyes, deafness, tinnitus, sore throat, febrile diseases, pain in the elbow and arm, motor impairment of fingers. Function: Relaxes sinews, removes obstructions from the channel, clears heat, regulates the stomach, promotes fluids transformation, benefits original Qi, tonifies Penetrating and Conception vessels. Indications: Pain in the arm, shoulder and wrist, malaria, deafness, thirst. Function: Expels wind-heat, releases the exterior, removes obstruction from the channel, benefits the ear, subdues Liver yang. Indications: Febrile diseases, headache, pain in cheek, strained neck, deafness, tinnitus, pain in the hypochondriac region, motor impairment of the elbow and arm, pain of the fingers, hand tremors. Function: Regulates Qi, removes obstructions from the channel, removes obstructions from the Large Intestine, clears heat, expels wind. Indications: Tinnitus, deafness, pain in the hypochondriac region, vomiting, constipation, febrile diseases, aching and heavy sensation of the shoulder and back, sudden hoarseness of voice. Function: Removes obstructions from the channels, benefits eyes and ears, stops pain. Indications: Deafness, pain in the ear, epilepsy, pain of the arm. Function: Clears heat, removes obstructions from the channels. Indications: Deafness, sudden hoarseness of voice, pain in the chest and hypochondriac region, pain in the hand and arm, toothache. Function: Courses the channels and quickens the connecting vessels, frees and regulates the waterways, disinhibits the throat and opens the portals. Indications: Deafness, toothache, migraine, sudden hoarseness of voice, pain in the forearm. Function: Relaxes tendons, resolves damp and phlegm, dispels masses, clears heat, dispels stagnation, regulates nutritive and defensive Qi. Indications: Migraine, pain in the neck, shoulder and arm, epilepsy, scrofula, goiter. Function: Frees the channel and connecting vessel, clears heat and drains fire. Indications: Motor impairment and pain of the shoulder and arm, migraine. Function: Courses the channels, quickens the connecting vessels and moves Qi, clears and drains depressed heat in the Triple Energizer. Indications: Headache, neck rigidity, motor impairment and pain of the arm. Function: Clears and discharges pathogenic heat, frees the channels and connecting vessels, disinhibits the joints. Indications: Goiter, pain in the shoulder and arm. Function: Dispels wind and overcomes damp, moves Qi, quickens blood and relieves pain. Indications: Pain and motor impairment of the shoulder and upper arm. Function: Clears heat and drains fire, dispels wind and eliminates damp, reduces swelling and stops pain, frees the channels and quickens the connecting vessels. Indications: Headache, neck rigidity, facial swelling, blurring of vision, sudden deafness. Function: Expels wind, benefits the ears. Indications: Tinnitus, deafness, otorrhea, facial paralysis, toothache, swelling of cheek, scrofula, trismus. Function: Clears heat and resolves tetany, quickens the connecting vessels and relieves pain, opens the portals. Indications: Headache, tinnitus, deafness, infantile convulsion. Function: Courses wind and quickens the connecting vessels, frees the channels and relieves pain, quiets the spirit and settles fright. Function: Clears the head and brightens the eyes, courses wind, quickens the connecting vessels. Indications: Tinnitus, redness, pain and swelling of the eye, swelling of the gum, toothache, parotitis. Function: Courses the channels and quickens the connecting vessels, opens the portals and boosts hearing. Indications: Tinnitus, deafness, otorrhea, toothache, stiffness of the lip. Function: Dispels wind and frees the connecting vessels, opens the portals. Function: Expels wind, brightens the eyes, stops pain. Indications: Headache, redness and pain of the eye, blurring of vision, twitching of the eyelid, toothache, facial paralysis. Reducing fever and chills caused by pathogenic infection. Enhancing the health of the ears, and treating hearing disorders. ​Removing energy imbalances that negatively affect the eyes. ​Removing energy imbalances that negatively affect the neck, throat, and tongue. Calming the emotions and reducing mental ​issues, including restlessness, mania, epilepsy, and agitation. ​Treating physical pain in the chest, especially near the heart. ​Getting rid of headaches, especially those focused on the side of the head near the temples. Treatment of nausea and constipation. The Triple Energizer meridian, like all other primary meridians, also contains secondary and tertiary energy pathways that are not shown in the map of the regular meridian line. These secondary pathways do not feature their own acupuncture points that are used in acupuncture treatment. However, they are important to be aware of because the energy flow of the meridian also affects the areas through which these extra energy pathways pass. 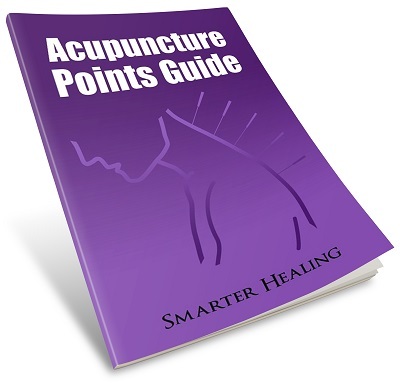 Therefore, you can often treat a health or pain issue in one of these secondary areas by ​​stimulating an acupuncture point on the primary meridian to which they are connected. ​First we have the Triple Energizer luo-connecting vessel. This energy pathway separates from the primary meridian line at acupoint TE5 near the wrist. It travels up the arm alongside the main line until it reaches the shoulder, at which point it decides to take a turn and travel onto the side of the chest. ​Once on the chest, it converges with the Pericardium meridian near acupoint PC1. Next we have the Triple Energizer divergent channel. ​This energy pathway separates from the primary meridian line on the side of the head, behind the ears, near several acupoints from TE17 to TE20. Part of this pathway travels upwards to the crown of the head​ near the Governing Vessel acupoint GV21. The other half of this energy line travels down the neck, onto the front of the chest near the collarbone, and down along the front of the chest alongside the Conception Vessel. Along the way, it branches out into the chest near the lungs. Finally, we have the Triple Energizer sinew channel. This area of muscle and tissue begins on top of the primary meridian point TE1 on the fingertip. It travels up the arm following the primary meridian line, connecting to the joints at the wrist and elbow along the way. Once it reaches the neck, it partially joins together with the Small Intestine sinew channel before continuing up the head. It's difficult to see clearly on this small illustration, but at the base of the skull the sinew channel separates into two branches. One branch goes forwards along the face, under the chin and into the throat, where it connects with the tongue. The other branch goes up the side of the head where it reaches the temple and then continues until its end on the side of the forehead where it binds to the skull. It is because of this sinew channel across the ​temple that Triple Energizer acupuncture points can be used effectively to treat some forms of headaches.